This year has been a life changing year for me. It was my first year teaching Grade 6 for a whole year and I was beyond excited for the opportunity to do so. I knew I wanted to do things very differently. I know that March seems like a weird time to reflect on how the year went, but I am now on pregnancy leave until my Baby Boy comes in April. This year was an uncomfortable journey as I wrestled with the image of what school should look like to what I wanted my classroom to look like. I discussed my uncomfortability of these differing viewpoints here. It was a transition for me and my class. I went from thinking that a classroom should be quiet to a classroom should be a buzz of discussion and questions. It was a lot and some days I grew frustrated with the change and some days it was incredible. Students in my class had choice in most things we learned about this year. For example, they got to choose an important person to write a biography on and they decided which Canada History Event they wanted to learn about for social studies. Having choice in the classroom and their learning allowed them to remain very focused on their learning since they were extremely engaged. Students also decided this year how our classroom was going to be set up and what jobs we needed to cover so our classroom would run smoothly. We had many classroom discussions about behaviour problems, problems we ran into, and classroom decision making. For example: I started to notice a trend of students getting off task and unfocused at around 10:20am each day. They would start talking about subjects not related to school and be quite loud and distracting about it. After a couple times of noticing this, I called a class meeting. I mentioned what I had started to see and asked them what the problem was. The class spoke up and told me that were finding it hard to focus for that long period of time and they would like a break. Some students wanted a break to chat with their friends about something that happened that night, or some needed to move or some just wanted a quiet minute to draw something. I started a break time. They had 20 minutes of a break to read, draw, chat or participate in a Go Noodle. I’ll be honest, to get into their routine it took me a while. I kept on forgetting and their behaviour would continue to be off task. I decided to put reminders in my FitBit so my wrist would vibrate when it was time for a break. Starting the breaks everyday made a huge difference in their behaviour and focus. It also gave them the chance to problem solve a solution. I also asked my students what having voice and choice in their classroom meant to them. Check out this post for more details about that. Students knowing how to self assess how they are doing was something I really wanted to focus on this year. I wanted them to know what mark they were going to get even before they handed in their work to me. This took a lot of planning and practice but creating rubrics and checklists as a class was the best way for students to know exactly what was expected of them. From the beginning of the year until now, I’ve seen a huge improvement of how my students self assess themselves. Before, I would get random A’s or D’s that didn’t fit into what I was seeing at all. Now when they self assess, it is usually exactly the same as what I marked them or within one grade difference. I truly believe that this will help them do better in higher grades going forward. I remember the stress of bringing that report card home and knowing that you would be in trouble for whatever it said but always assuming the worst. I did not want my students to feel that way about school and marks so I decided to be as transparent as possible with report cards. I worked with my students to teach them about self assessing their own learning skills. This was a learning process for me, so please read the linked blog article to know more. Grades in my classroom are not a taboo topic. We talk about them at length, students share stars and wishes and reflect on what they did well and what they need to do better next time. I stress to my students that school is a learning process so they should be asking for help and redoing work they made mistakes on, that is how we ALL learn. All grades are self assessed by students, discussed with me, or shared with students who reflect on their grade and learning and store their marks in their student led conference binder. Before report cards home, I print off my draft copies of the reports and share them with the students. I ask them to edit my work if I made any mistakes, to look at the grades and comments and see if they agree or disagree. If they disagree, they must circle the problem and come up with an explanation of why they deserve a better mark and then we can discuss it. For more about this process, check out this blog post. Most students feel that their report card is a fair representation, some challenged their grades and I have changed marks based on their arguments and for some it is a wake up call that their lack of responsibility in their learning has affected their mark and will be communicated to their parents. I wanted for my students to have real world experience of collaboration. Working as a group gets all students to share their expertise, strengths and to help each other with their weaknesses. Some of my students who struggle produced amazing projects with the help of their group. Of course, these students probably didn’t contribute as much as the other students but by working together I know that they understand the topic we are studying more deeply than they would if they were working on their own. 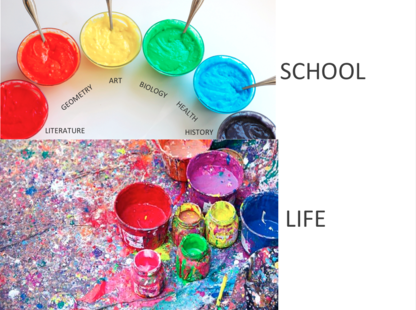 Also life isn’t separated into learning subjects by themselves, it is a mess of subjects integrated with each other. I wanted to give my students the chance to learn authentically using the internet and finding relevant information. I also wanted to mark them on many different subjects at once. For example, for the space unit we just completed (addressed in this post) I marked their knowledge of space and writing since they were also learning how to write a report. All the projects we worked on this year assessed more than the subject we were completing the work in. I felt it was more authentic that way. I’m going to be honest. I’m a terrible speller and I thank google for auto correct and siri everyday. I wanted to teach my students how to use these amazing tools we have at our fingertips properly and how to help them in their learning. I have used Siri in my classroom, in front of my students to show them how to spell different words. I use it on a daily basis and why shouldn’t they? I have also shown them that while using google docs, if you misspelled a word, it will underline it in red for you so you know that you need to correct it. I’ve also shown them Google Read and Write and how to get the program to read what you have written back to you. I use this when I am writing report cards to make sure it makes sense. So many students need to use this tool but don’t know about it. Getting them the tools they need to succeed is just a smart thing to do. Before smart phones, teachers used to drill in times tables into our heads. even completing those mad minutes, I still don’t remember all my times tables. With smartphones being in our pockets, who of us haven’t reached into our pocket to help us calculate something while out shopping? Why not encourage our students to do the same. Understanding the concept of multiplication or division is so much more important than knowing all their times tables. Some of the things we did in class worked so well and I am so proud of my students for how well they did them. Students’ learning how to self assess themselves was one of the highlights of my year. I want to continue doing this but I want to make sure that they are deeply thinking about what they have done well and what they need to improve on. Student Led Conferences was something I really focused on this year in class. We spent a lot of time saving our work and reflecting on what we could have done better for next time. Although I sent notes and emails home and had very open times where parents could come into our classroom whenever they were free, we had limited parents who came. I would love next year to have more parent involvement. I let my students have a say in every part of our classroom and that was also problem solving. It was clearly needed that we needed to set up classroom jobs, but I waited until the students brought up the subject and what jobs they thought we needed for our classroom to run smoothly. Many of my supply teachers mentioned to me how much that they loved that the jobs just ran themselves. Some of the jobs we had were recyclers, date, calendar, Tweeter of the day, Technology organizer, and more. My class met often to discuss problems we were having in class to try to create resolutions together. My students would even notice issues and call meetings so we could vote on certain topics. I would like to have classroom meetings more often so the shy students can get more comfortable sharing in these settings. I’m just wondering how often to have them and what to share and talk about. Bring your own device (BYOD) was such a great aspect to our classroom. As discussed above I wanted my students to actually use the tools they had at their disposal so they could see these devices as a learning tool rather than a music player and learn the responsibility that comes with it. I only really had to have 2 discussions with my students about how to use the devices appropriately and since we used them everyday, it really was not a big deal. Using twitter in the classroom was an amazing experience this year. As stated above I need to improve how we use it in the classroom. Next year I would project our twitter feed onto the screen every morning so students can look through our feed together and read blog articles or watch videos they are interested in. I think this would engage them more and they would want to tweet more often. I want to meet with students more often and figure out a better way to take notes about how they are doing and what they are working on. This year I used a Google Form to document but I’m not sure if that is the best way. Sometimes I’m going to need to meet with certain students or students are going to need to meet with me. Next year, I’m going to have a ‘I NEED to meet with Mrs. B’ spot where students can sign up to meet with me and they will be the first priority that morning. I felt that through blogging, emails, and notes home, I did communicate well with parents. Obviously some more than others. I would really like to set up a system about how to send more positive notes home about the students on a daily basis. We blogged this year at http://techtitians.edublogs.org/. We didn’t get as much traffic and comments as I wish we had. Next year I want to think about what is the easiest way for parents and others to see what we are doing in class. Maybe a facebook group? This has been my most exciting, thought provoking, inspiring year for me as a teacher. I’m so proud of my class and what we accomplished this year. I would be very grateful if you have any tips or feedback to share if you could comment below. If you read my blog you know I’m doing something different in my class this year. I’m giving my students choice in everything they do. We have just completed our first social studies project together and I wanted to share the process and outcome. In Grade 6 students about supposed to learn about Canada’s impact on the world. I decided to share a Canadian History timeline with them and let them choose a topic of their choice. Students worked in groups to create something to show the class. The presentations were varied. We had mostly slideshows but also had posters, homemade videos, and models. After their presentations were completed I gave the group a self assessment rubric and they went off and had time to self-reflect. I met with the groups later that day or the next day and we compared their self-assessment rubric with the one I completed. We discussed the differences in the rubrics and the similarities. If there was a discrepancy, I let the students determine what grade they should have. When all the presentations were discussed, we met as a class to talk about the project in general. I wanted to know what did they like, and what needed to be fixed. As you can see, the class loved being able to choose their own topic, assessment type and they got to work with peers of their choice. Next time we are going to add some immediate peer feedback. Right after students present, their peers will share one thing they really liked about the project and one thing they would like to see next time. We also discussed how they could improve their own project next time. The experience giving my class choice in their learning has completely changed the way I look at teaching. The students couldn’t wait everyday to work on this project and were highly focused during their group work. I love talking to my class to get feedback about how the projects are going and it will be something I continue to do for the rest of my teaching career. I love the idea of incorporating student voice and passions with learning in my classroom. Doing Genius Hour with any primary class would be difficult since they are just learning their language skills. There is no better time to hook students on reading and writing then including their passions into our classroom learning. I decided to change the normal Genius Hour format so that my students could still learn about anything they are passionate about and be able to share their learning with the class. Step 1: Print many of these blank booklets for your students to fill out and staples them together. Step 2: Meet with your student and ask them what they want to learn about. Step 3: Go to Wikipedia and type in what they want to learn about. Step 4: Print if they are advanced in their reading level or go to the left sidebar and scroll down to Languages and choose Simple English. This will take their subject of interest and create a simpler to read text. Step 5: Give them a highlighter and get them to highlight the important information. Step 6: Students will create sentences and pictures based on what they learned. Step 7: Share with the class, school or the world! Here are some examples from my Grade 1/2 students. These are posted with their parent’s permission.